Co. Inc. 250-252 W. 27th St. Truly a family business, Reliable Automatic Sprinkler Co. is described as follows in martindale.com (a legal practices website) (2012): "Reliable Automatic Sprinkler Co. … bills itself as one of the world's largest producers of automatic fire sprinklers and sprinkler system control equipment. Headquartered in suburban Elmsford, New York, Reliable has approximately 700 employees and enjoys annual gross sales of about $220 million. The company was founded almost 100 years ago by Frank J. Fee. His son, Frank J. Fee., led the company from 1945 until his death in 1976 when his son, Frank J. Fee III ('Frank') became president. The senior management also includes Frank's two brothers, Kevin Fee and Michael Fee. Since their mother's death in 2009, the three brothers constitute the company's Board of Directors." A more complete company history can be found at the website of the Boston Chapter of the American Society of Plumbing Engineers (2013): "Reliable was founded in 1918 by Frank J. Fee, a mechanical contractor who began manufacturing sprinklers when he had trouble securing them for his own jobs. Frank J. Fee, Jr., succeeded his father as company president in 1945, and his son, Frank J. Fee III, became president in 1976. This puts Reliable today in its third generation of Fee family leadership. As part of senior management with Frank J. Fee III are his two brothers, Kevin T. Fee, Executive Vice-President, and Michael F. Fee, Vice President, Marketing and Sales Operations. The family-run company also has many employees who have served in excess of 25 years, enhancing its team-family tradition. The company is a manufacturer of automatic fire sprinklers, valve and accessory products, and a major distributor of sprinkler system components. Reliable produces both of the industry's two basic types of sprinklers - the solder type and the frangible bulb - for virtually every type of building applications. Reliable also produces a broad range of valves including alarm, dry, deluge, preaction, and check valve that control water flow to sprinkler systems and actuate alarm signaling." 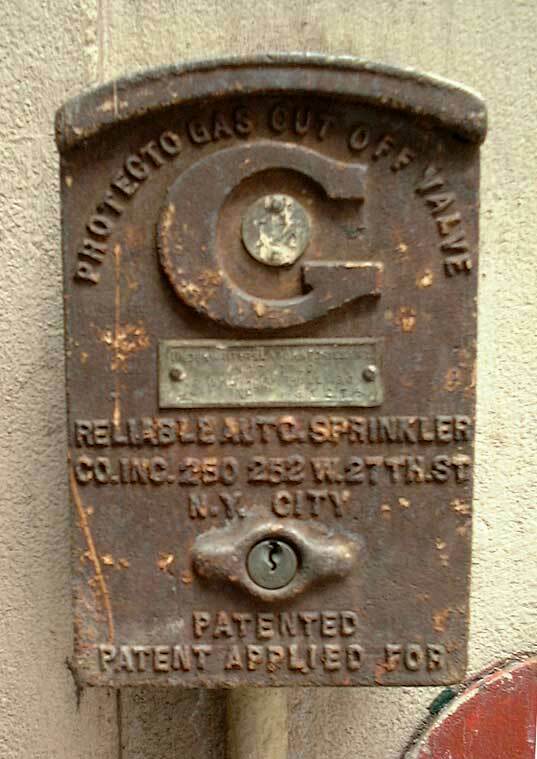 The original Reliable Automatic Sprinkler was located at 292 Ave. B (near 17th St.), New York City, which was the address of the contracting firm, Wells & Newton, where Frank J. Fee was president. City directories listed Frank J. Fee as president of Wells & Newton from 1915 to 1925. Reliable Automatic Sprinkler moved to 250 W. 27th St. in 1925, then left the city for Mt. Vernon, NY, in the late 1930s. Frank J. Fee (1872-1945) was born in Ireland, immigrated to the U. S. around 1887 and became a naturalized citizen in 1894. He appears in city directories as a plumber and steam fitter from as early as 1900. The website www.reliablesprinkler.com shows Fee in front of a Plumbing and Heating shop at 365 9th Ave. The photo probably dates from around 1906. The 1915 New York State census recorded him living at 701 W. 179th St., Manhattan. His son, Frank J. Fee, Jr., (1915-1976) was recorded as "231 days" old at that time. In 1920 a scandal involving plumbers and other construction contractors led to the indictment of 28 individuals and 24 businesses for practices intended to prevent competition in the industry. Among those indicted were Frank J. Fee and the Wells & Newton Co. During the trial Fee testified that he had tried to put an end to the illegal practices. Eventually, Fee was acquitted. Charles A. Murphy of Wells & Newton was found guilty.